In 2017 the Foundation Award – 10-days cultural and educational trip to Moscow is assigned to the clinical resident of the chair of pre- and post-graduate learning in neurosurgery of Kyrgyz State Medical Academy named after I.K.Akhunbaev (KSMA) BAIYMBET UULU TAALAIBEK. The Laureate was selected based on the winning in the competition of young scientists organized within the program of THE SCIENCE DAYS of KSMA held on April 12-14, 2017, this year already for the 6th time. 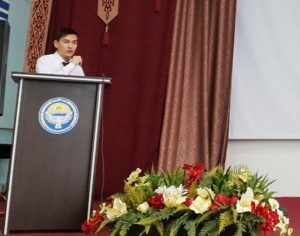 This forum, in our opinion, is essential for the development of science and medicine in the Kyrgyz Republic. We know that, unfortunately, the science and education are underfunded in our state. The country existence nowadays is impossible without development of science and education. Under such circumstances the regular medical societies meetings, scientific reports, professional discussions with the participation of students, clinical residents and postgraduate students of the KSMA and other medical and research institutions help to preserve scientific potential of the country until the favorable changes in the science & education policy of the country take place. At the beginning the initiative of holding THE SCIENCE DAYS on a large scale belonged to Professor N. N. Brimkulov, vice-rector of KSMA responsible for science in that period. It is a pleasure to note that the participants of THE SCIENCE DAYS and young scientists competition, Mirrakhimov Universiade organized this year have demonstrated enthusiasm, inspiration and competitive spirit. 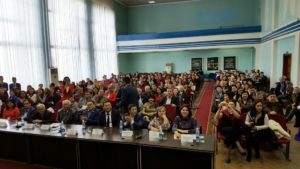 It is already a tradition to dedicate THE SCIENCE DAYS of each year to the outstanding events of personalities from the field of science and medicine of Kyrgyzstan. This year it was the name of academician M.M.Mirrakhimov, the acknowledged scientist and an outstanding clinician who has created in the country Scientific-research Institute of cardiology, who trained a galaxy of cardiologists and cardiac surgeons and has contributed to the development of high altitude medicine. During the years of SCIENCE DAYS existence the Academy leadership changed – now Professor I.O. Kudaibergenova appointed to the rector position. It should be noted, that change has not led to discontinuation of traditions, but rather, a good idea is picked up and continues to evolve. The rector established a commemorative medal for the contribution to the development of the Academy, which was awarded to the older generation of Academy professors. I was also awarded as the head of Sanjarbek Daniyarov Foundation supporting young scientists all this years. As in previous years, we will put photos on this website the report on the trip of Award winner – Baiymbet uulu Taalaibek.